Fashion Polish: September back to school/work giveaway part 2 : win a $200 Rescue Beauty Lounge shopping spree! 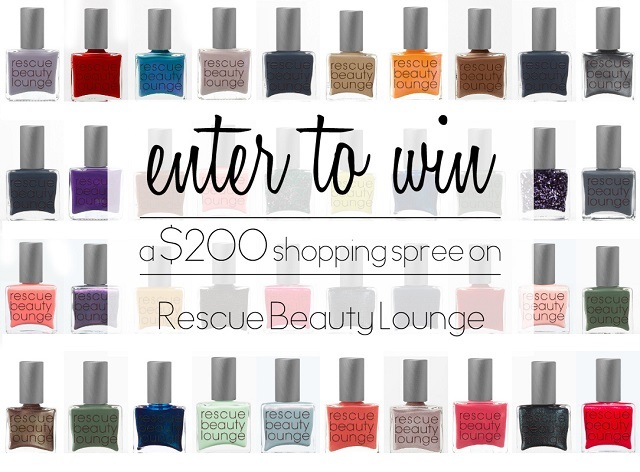 September back to school/work giveaway part 2 : win a $200 Rescue Beauty Lounge shopping spree! Hi guys, I'm back today with a second "September back to school/work" giveaway! To win your $200 Rescue Beauty Lounge shopping spree, generously sponsored by Ji Baek, fill in the Rafflecopter widget below and/or head over to Instagram to earn bonus entries! This giveaway is open internationally to anyone legal of age in their country. Entry is materialized by filling out the rafflecopter widget and/or posting a specific picture and tag on Instagram. A limit of one entry is allowed per e-mail address / Instagram account. You may not enter with different e-mail addresses or Instagram accounts. Subsequent entries determined to be submitted by the same individual using multiple email addresses or Instagram accounts will be declared ineligible. You may, however, obtain additional entries through specific channels when applicable and prompted (i.e. performing an action such as liking Facebook page, following a Twitter account,...). Fashion Polish cannot be held responsible for any late or lost entries, malfunctions or failures, giveaway disruptions, injuries, losses or damages caused by events beyond its control. All entries for giveaways through this site must be received on or before the given Entry Deadline Date to be eligible to win a prize. Winner will be selected randomly through rafflecopter among eligible entries. Winner must respond within three days of notification or forfeit the prize, in which case an alternate winner will be selected. All taxes associated with the receipt of the price are the sole responsibility of the winner. Winner may not substitute the prize for any other prize or monetary compensation.